In a sense, viruses are molecular hijackers bent on subverting host defenses, taking over a host cell’s ability to control nucleic acid and protein processing functions, and making copies of themselves to go out and infect more cells. Viruses don’t divide like cells, don’t generate their own energy, and are fully dependent on host cells and their proteins to replicate. Current understanding states that viruses are not living entities in their own right and that they must infect a host cell in order to generate copies. The term used for this is obligate intracellular parasite. One of the best ways that I have heard it explained is that viruses are like the code in computer programming. They will work when you feed them into the system and the orders that they encode are executed, but on their own they are non-functional. They are not alive; they can only tell a system to run their program, which in this case is the production of more viral particles. It’s kind of like having a computer virus on a small portable drive. It is completely harmless until you plug it into you computer and the information that it encodes starts to wreck havoc. While this may be an unfamiliar way to think of viruses and their functions, it is extremely helpful from a research standpoint. Each virus is now categorized based on the composition of its genetic material due to the genomics revolution and the “programming” for viruses is slowly being elucidated at the molecular level. We now know that viruses will produce specific proteins, microRNAs, and mRNAs that have specific functions. Slowly, we are also beginning to understand how these proteins interact with host cell proteins and how this leads to disease (or not) in the host. 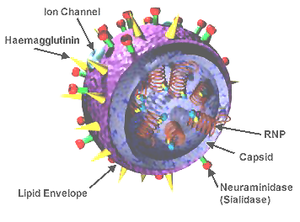 In many cases, the host response to the virus is what leads to what we think of as disease. This is very exciting because it provides researchers with the opportunities to develop targeted therapies specific to certain viruses and the pathways the cells that their programming disrupts. We can target either the viral half of the equation or the host half as both represent attractive targets for therapeutic intervention. A great recent example of this is the addition of hepatitis C virus protease inhibitors to the treatment regimen of Hepatitis C, which has increased the cure rate significantly. Viruses are unique in straddling the fine line between life and non-life and as such pose specific challenges for treatment and eradication. However, this same aspect is what will allow for the continued study and directed treatment of many illnesses using what we learn from the viral world. Featured image from Flickr user NIAID and used under a creative commons license. I’m taking graduate classes right now so a lot of what I’m posting is inspired by different things I encounter in lectures. There is just so much to know, it’s mind boggling. My hope is to convey the science well enough that people without years of background can appreciate it. I’m glad you liked it!